“Gunman shot through the glass door to the office and opened fire on multiple employees,” reporter Phil Davis tweeted at the time. Ramos reportedly held a grudge for years, including making threats against the newsroom, after it published a story about him in The Capital newspaper. He also had filed a defamation lawsuit, which was dismissed. The 38-year-old, who is being held without bond, did not appear Monday at the Anne Arundel County Circuit Court, though the scheduled appearance attracted a large group of reporters, according to the Capital Gazette. Two Gazette reporters who witnessed the attack were at the court to watch the proceedings. Ramos’ lawyers entered the not guilty plea in court documents, which “negated the need for Ramos to appear in person for the arraignment,” Reuters reported. The charges include five counts of first-degree murder, one charge of attempted first-degree murder, six counts of assault and 11 counts of firearm use. Ramos is being represented by public defenders. The defendant was “identified by authorities through facial recognition technology,” according to The Associated Press. 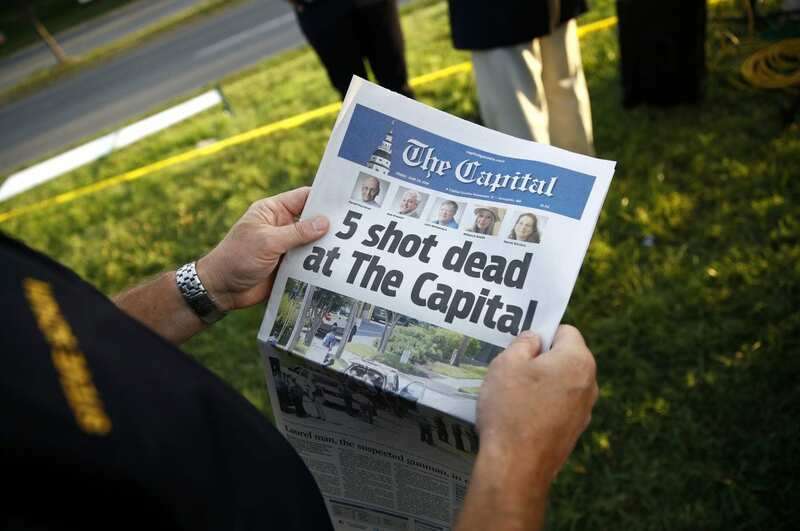 Since the shooting, and amid an outpouring of support, the newsroom hasn’t missed a day of publication. The Gazette says more than 800 people subscribed to its digital edition the day after the attack. Journalists from around the country have pitched in to help the Gazette. Baltimore Sun opinion editor Andrew Green, who is coordinating the extra help, told NPR that more than 380 journalists offered to pitch in within 24 hours after an open call for assistance. “And so to see that common sense of purpose among so many — literally at this point hundreds of people in our profession — has been, you know, a bright spot in what has otherwise been a very, very terrible situation,” Green said.